If you’re in midtown Manhattan, be prepared for a new fitness craze to start up pretty much every other week. At least, that’s how it seems sometimes. The latest one to hit midtown is Slip ‘N Slide. Manhattaners can find classes at the Revolution in Motion Studio. It’s a bit like speed skating, but without the skates! 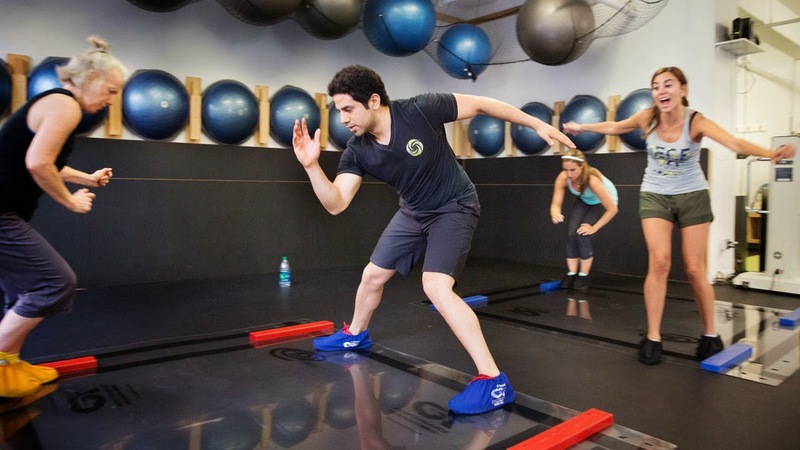 What’s great about this new workout is that it’s fun, while providing a complete body highly intense, but low impact workout, focusing on the nervous system. This makes it very good for those recovering from a sports injury or even a stroke, etc. And, it only takes an hour. It was chiropractor Dr. Edythe M. Heus (who also happened to be the head trainer for ‘Spider Man: Turn Off the Dark’ musical) who started it all. Participants wear special booties over their sneakers and two participants are on each board. Each board has plastic bumpers fastened to the corners to help stop them sliding off. Initially it is an adjustment to just remain upright. But soon enough arm swings are added to increase the momentum of the workout. It’s great for balance too. It’s challenging at first, but a lot of fun and truly great as a workout and an overall enhancement of body confidence. Who knows what the midtown will get next?